Beijing-Part 1 | the best is yet to come. This is a lengthy blog post about my weekend in Beijing. I am dividing it into three parts because there is so much I want to share! If you don’t want to spend a lot of time reading this post here is a short list of what I did there: Tiananmen Square, the Forbidden City, the Temple of Heaven, the Summer Palace, the Panda House, the Lama Temple, the Confucian Temple, Hutong rickshaw tour, the Drum Tower, shopping in Nanluoguxiang, traditional tea ceremony, eat Peking duck, watch a Kung Fu show, hike the Great Wall, Jade Factory, and the Olympic Park. I have been in Asia for three weeks! Crazy! This past weekend was our first free weekend. So a few of my friends and I decided to travel to Beijing. (Landon, Stephanie, Lauren, and Andrew were the individuals I traveled with.) We booked our flights well in advance through Expedia. We all went in on a hotel room and paid for three tours. We also had to apply for Chinese visas which took about a week to obtain. Friday my friends and I only worked a half day since our flight was set to leave at 8:10pm. The airport in Hong Kong is on Lantau Island and it took roughly forty five minutes on a bus to get to the airport. We were a bit nervous checking in because Expedia had sent our confirmation emails to the wrong people and it was a bit messy figuring it out. Once we got there it was a simple check-in. When we arrived at our gate the line was huge to board the plane. After boarding the plane we were notified that the weather conditions in Beijing were not great and that our flight was delayed. We sat on the plane until we finally took off at 2:30am. It was horrible. We arrived in Beijing at 6am. Our tour started at 8am so we quickly grabbed a taxi, piled in, and took off for our hotel. We stayed at the Beijing Marriott City Wall Hotel. It was a lovely hotel and I would definitely stay there again if I ever go back to Beijing. We didn’t have any time to eat breakfast before our tour started so we ran up to our rooms, changed clothes, and started our first day in Beijing. My friends and I didn’t really know what to expect from our tours in Beijing. The only information we had about the company was the good reviews online. Many of us thought we would end up in a huge tour group following a man with an umbrella over his head while we strained to keep pace while listening to an ear piece he was feeding us information into. We were extremely pleased when a Chinese man in his early forties showed up to our hotel Saturday morning and led us to a small van with a nice Chinese man as our driver. It was just us! Our tour guide Hubert informed us that for all three tours we booked he would be the guide and we would have the same driver and van. The first stop Saturday was Tiananmen Square. We wore longer pants so we could enter the Chairman Mao Memorial Hall, commonly known as the Mausoleum of Mao Zedong. It is the final resting place of Mao Zedong, founder the Communist Party of China from 1943 and the chairman of the Central Committee of the Communist Party of China from 1945 until his death in 1976. Although Mao had wished to be cremated, his body was embalmed and construction of a mausoleum began shortly after his death. The remains of Mao are on display for public viewing. People line up for hundreds of meters every day to see the former chairman, many paying tribute to him with flowers. Since it was Saturday the Memorial Hall was closed and we couldn’t see Mao. I wasn’t disappointed about missing Mao because the thought of seeing someone who has been embalmed and preserved for the past 37 years is a little weird. 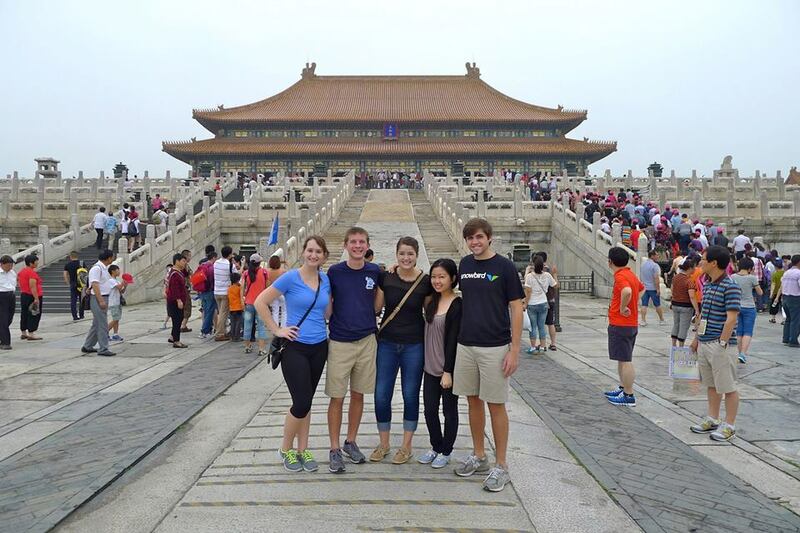 We walked the length of Tiananmen Square over to one of the entrances to the Forbidden City. The entrance we went through has the photo of Mao over the main doorway. Upon entering the city I saw people everywhere! I also saw another building ahead of us. You see I thought I would walk into this amazing Forbidden City that I have seen animated in Disney’s Mulan movie and have an “ah-ha” moment. I kept waiting to see that iconic building but I never did. Turns out all the palace buildings within the Forbidden City kinda look the same. As I walked through massive courtyards to the back of the city I imagined all the Emperors who had lived there with their family and court. You see traditionally, the Forbidden City is divided into two parts. The Outer Court or Front Court includes the southern sections, and was used for ceremonial purposes. The Inner Court or Back Palace includes the northern sections, and was the residence of the Emperor and his family, and was used for day-to-day affairs of state. If you want to know more about the Forbidden City I suggest you buy a book because the history is quite extensive and even I can’t recount everything I learned. I have been to a fair amount of castles, palaces, and courtyards and by far the Forbidden City is the most impressive of them all. After the Forbidden City we headed to a silk factory, the Temple of Heaven, the Panda House, and the Summer Palace. The silk factory was really interesting. We were shown the silk worms stages of grown and the process of making silk. I was tempted to buy a pillow stuffed with silk but then I remembered I had a ton of pillows on my bed at home already. So I decided to purchase a hand painted piece of art. It is a painting of red cherry blossoms which is an iconic tree in China. I can’t wait to have the artwork framed and hanging in my house someday! 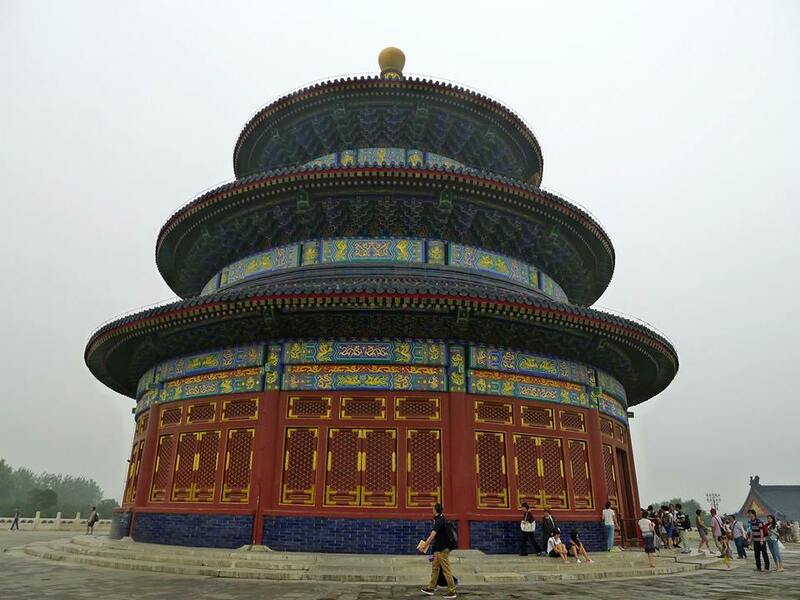 At the Temple of Heaven was constructed from 1406 to 1420 during the reign of the Yongle Emperor, who was also responsible for the construction of the Forbidden City. The Temple of Heaven is a magnificent triple-gabled circular building, 36 meters in diameter and 38 meters tall, built on three levels of marble stone base, where the Emperor prayed for good harvests. The building is completely wooden, with no nails. The original building was burned down by a fire caused by lightning in 1889. The current building was re-built several years after the incident. This building features an interesting configuration of supporting pillars which contribute to the strong sense of numerology in traditional religion in China. As we left the Temple of Heaven we passed many Chinese people playing games together in the park. Our tour guide stopped us near a group of elderly men playing a board game that looked similar to chess. Hubert, our guide, explained that the game is called Xiangqi and it represents a battle between two armies, with the object of capturing the enemy’s general (emperor). It is a very old Chinese game that many love to play. We also saw people playing a form of hacky-sack. Instead of a small ball of beads/rice they used an object made of colorful feathers and tin. It is hard to explain. Our guide bought us one to share and have fun with. The third destination was the Panda House. 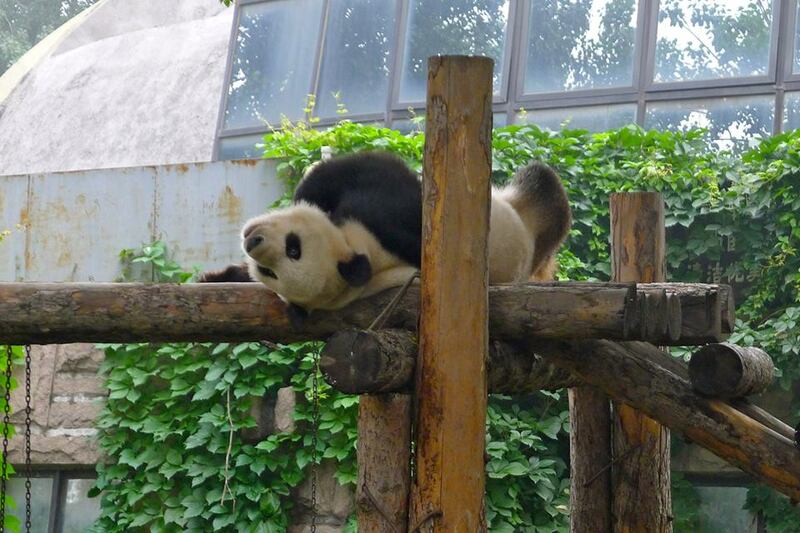 The only thing that really needs to be said about this part of the tour is that pandas are adorable! Also, public toilets in China are gross. So if you ever go bring toilet paper with you and hand sanitizer. The toilets are literally holes in the ground that you squat over. So all you can do is say a few prayers that you don’t miss and make a mess. The final stop of our tour was the Summer Palace which was an expansive piece of property that includes a natural lake. Unfortunately, it was pretty smoggy out and the skies were grey so the views weren’t as beautiful. However, it was still an enjoyable area to walk through. It reminded me of Central Park in NYC. Saturday night we met up with Landon’s friend who is in Beijing to teach English. She was very sweet and we enjoyed a nice meal. Most of us ate a personalized pizza. It was yummy! The train system in Beijing closes at 11pm so we ended the night early and got much needed sleep for our second day in Beijing.